NASA's Chandra X-ray Observatory has captured a spectacular image of G292.0+1.8, a young, oxygen-rich supernova remnant with a pulsar at its center surrounded by outflowing material. Astronomers know that pulsars are formed in supernova explosions, but they are currently unable to identify what types of massive stars must die in order for a pulsar to be born. Now that Chandra has revealed strong evidence for a pulsar in G292.0+1.8, astronomers can use the pattern of elements seen in the remnant to make a much closer connection between pulsars and the massive stars from which they form. This Chandra image shows a rapidly expanding shell of gas that is 36 light years across and contains large amounts of elements such as oxygen, neon, magnesium, silicon and sulfur. Embedded in this cloud of multimillion degree gas is a key piece of evidence linking neutron stars and supernovas produced by the collapse of massive stars. Standing out at higher X-ray energies, astronomers found a point-like source surrounded by features strikingly similar to those found around the Crab Nebula and Vela pulsars. These features, together with the X-ray spectrum of the central source and surrounding nebula, provide strong evidence that a rapidly spinning neutron star is responsible for the central observed X-radiation. Astronomers believe that an oxygen-rich supernova explosion is triggered by the collapse of the core of a massive star to form a neutron star, releasing tremendous amounts of energy in the process. 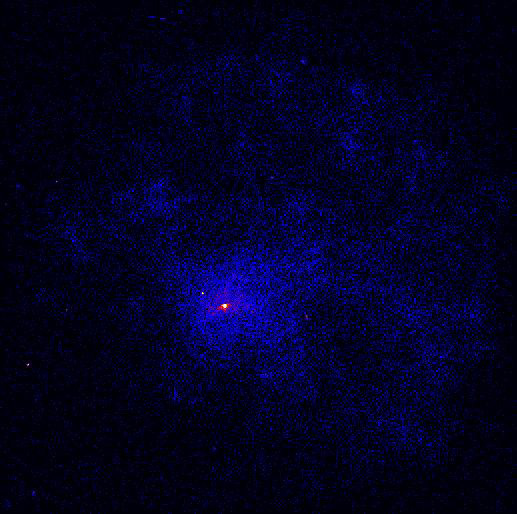 "This finding is very important, since it would allow us to conclusively associate this young, oxygen-rich supernova remnant with a core collapse, massive star supernova explosion," said John P. Hughes of Rutgers University, lead author of a paper describing the research which appeared in the October 1, 2001, issue of The Astrophysical Journal. With an age estimated at 1,600 years, G292.0+1.8 is one of three known oxygen-rich supernovas in our Galaxy. These supernovas are of great interest to astronomers because they are one of the primary sources of the heavy elements necessary to form planets and people. 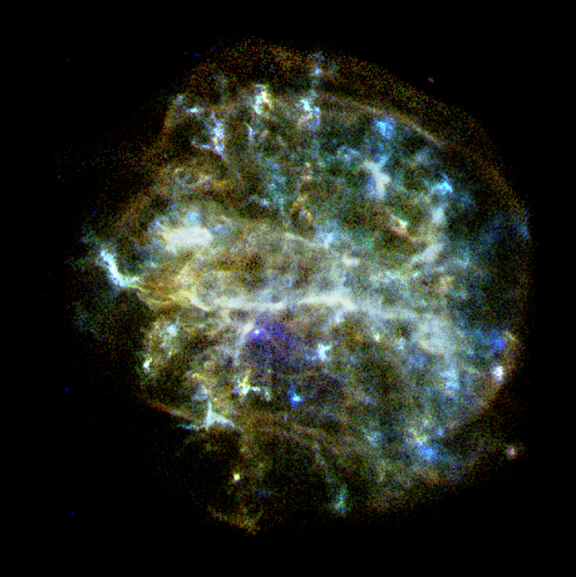 Scattered throughout the image are bluish knots of emission containing material that is highly enriched in oxygen, neon, and magnesium produced deep within the original star and ejected by the supernova explosion. Elsewhere in the image one can trace whitish colored regions (like the thin, nearly horizontal filaments just above the purple nebula) and yellow regions (scattered internally, and around the periphery). This material is of a more standard composition without the enrichment seen elsewhere and represents either the pre-existing surrounding matter or the outer layers of the star itself, lost at an earlier time before the star exploded as a supernova. The research team, which also included Patrick Slane (Smithsonian Astrophysical Observatory), David Burrows, Gordon Garmire, and John Nousek (Penn State University), Charles Olbert and Jonathan Keohane (North Carolina School of Science and Mathematics), used the Advanced CCD Imaging Spectrometer instrument to observe G292.0+1.8 on March 11, 2000. NOTE:The Chandra results prompted a team of radio astronomers led by Fernando Camilo of Columbia University to use the Parkes radio telescope in Australia to observe the pointlike X-ray source in G292.0+1.8. On October 3, 2001 they discovered that it is a radio pulsar with a period of 135 milliseconds.